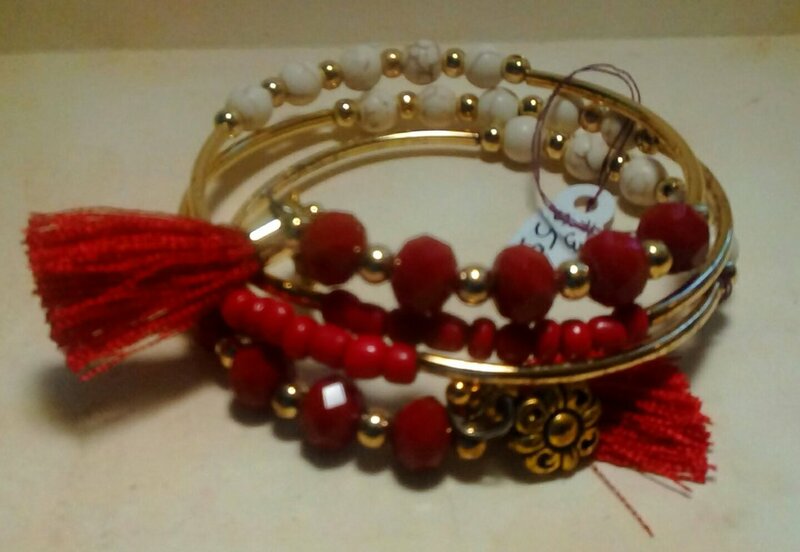 22k gold plated tube & red coral beadwork on fully adjustable to fit any wrist memory wire. 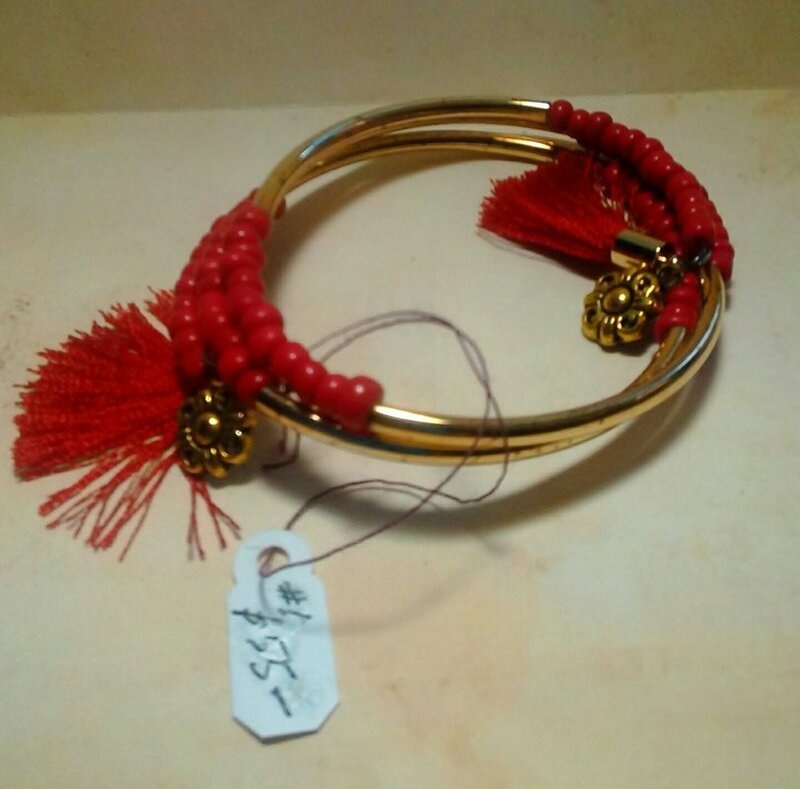 Accented with two 22k gold filled floral charms & 22k gold filled drops w/red silk tassels. 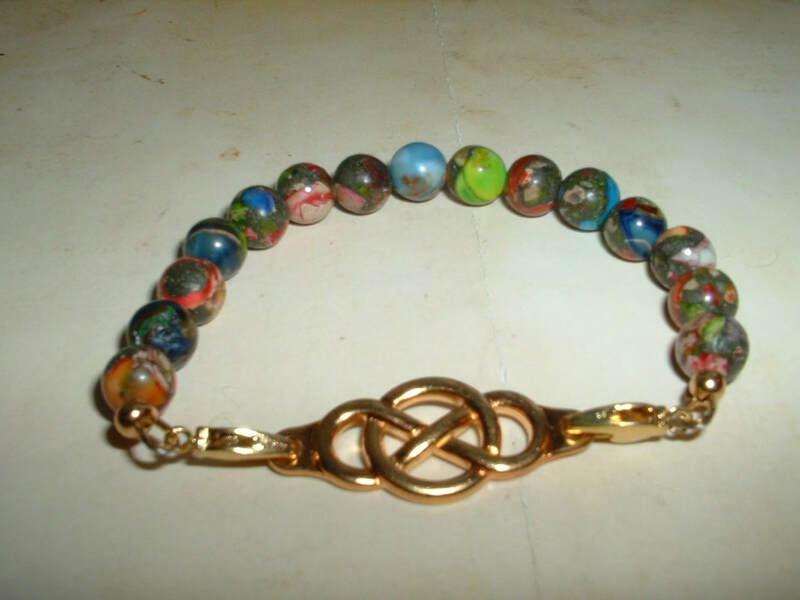 22k gold plated tube, faceted white agate, 22k gold filled rounds, howlite stone & a rainbow of Dakota jasper beadwork on fully adjustable to fit any wrist memory wire. 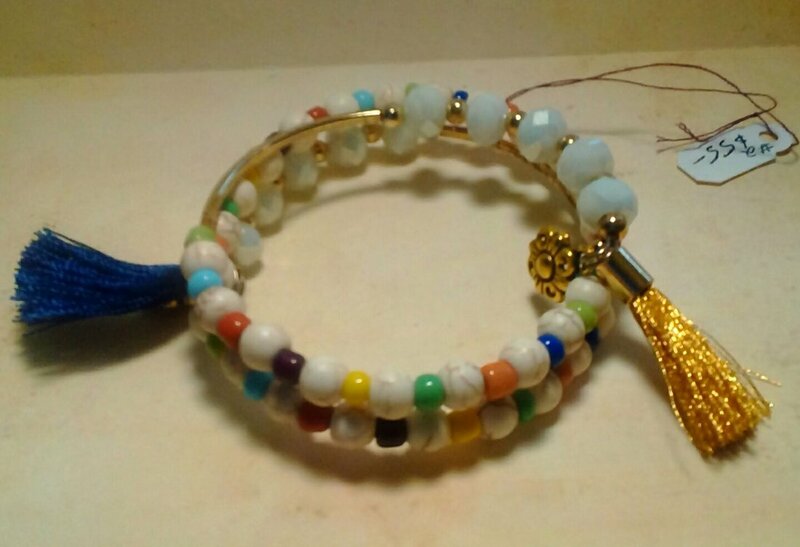 Accented with two 22k gold filled floral charms & 22k gold filled drops w/navy and gold silk tassels. 22k gold plated tubes, faceted & round red coral, howlite stone, 22k gold filled round beadwork on fully adjustable to fit any wrist memory wire. Accented with two 22k gold filled floral charms & 22k gold filled drops w/red silk tassels. 22k gold plated tubes, faceted white agate, Dakota jasper & 22k gold filled round beadwork on fully adjustable to fit any wrist memory wire. 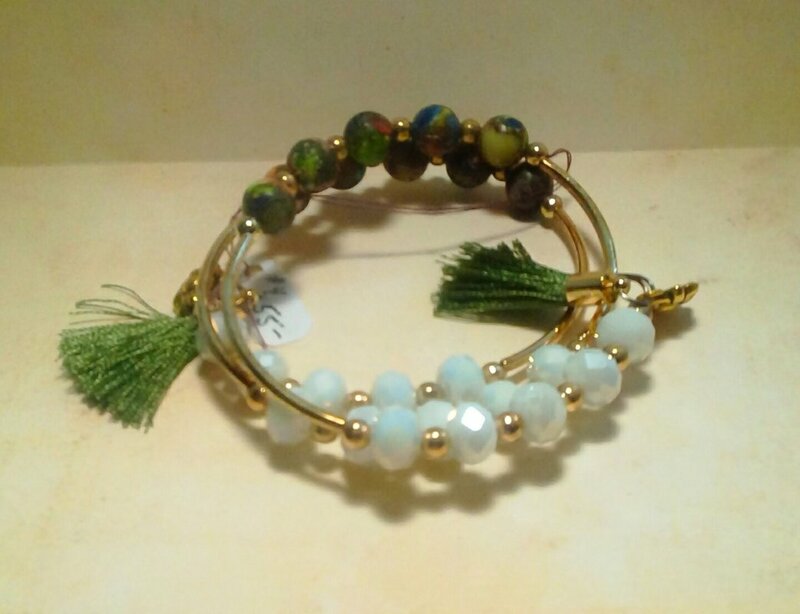 Accented with two 22k gold filled floral charms & 22k gold filled drops w/green silk tassels. 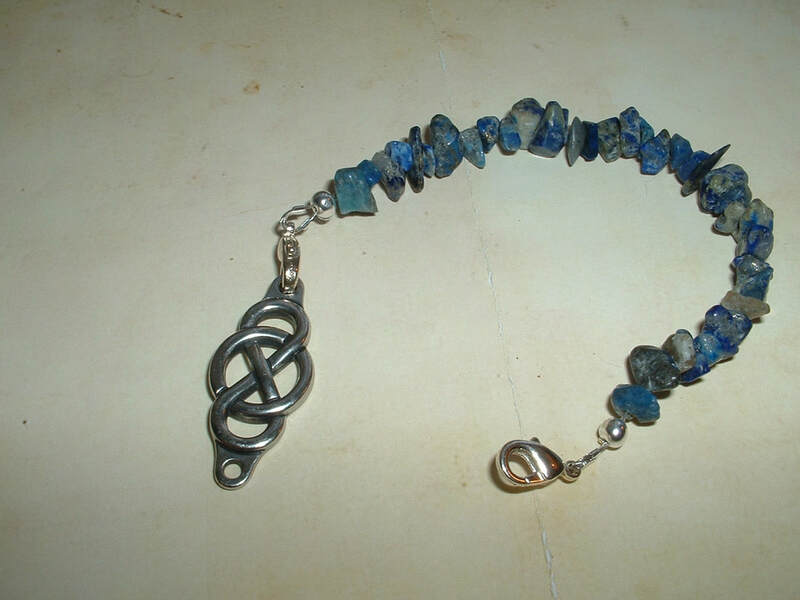 Sterling plated tubes, sky jasper, blue & green turquoise beadwork on fully adjustable to fit any wrist memory wire. 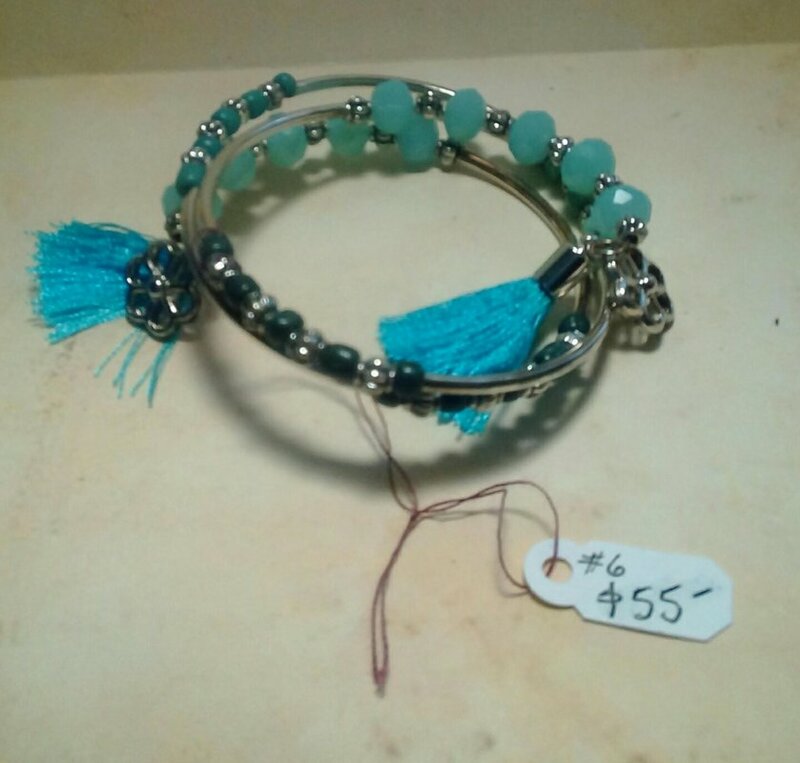 Accented with two sterling silver filled floral charms & sterling drops w/aqua silk tassels. 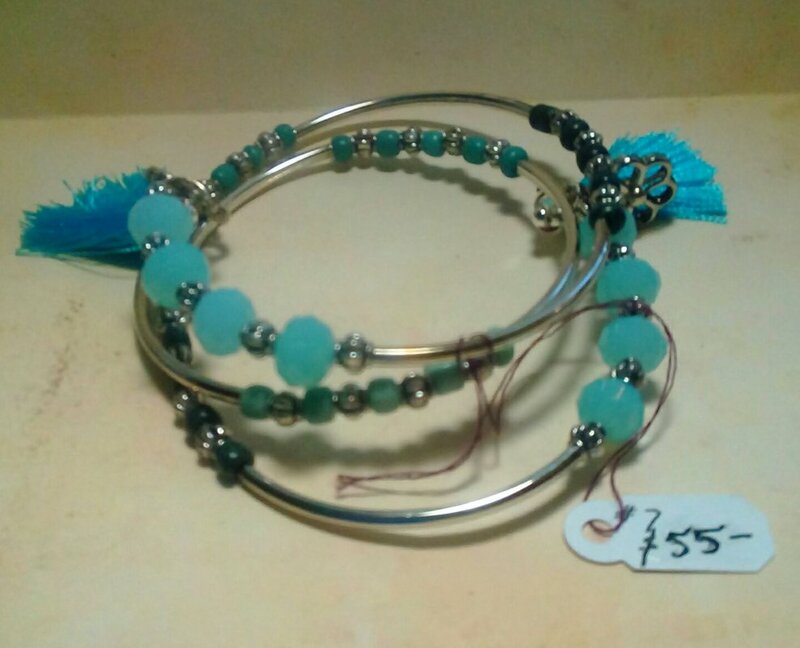 Sterling plated tubes, sky jasper, blue & green turquoise, faceted aquamarine & sterling filled bali style beadwork on fully adjustable to fit any wrist memory wire. 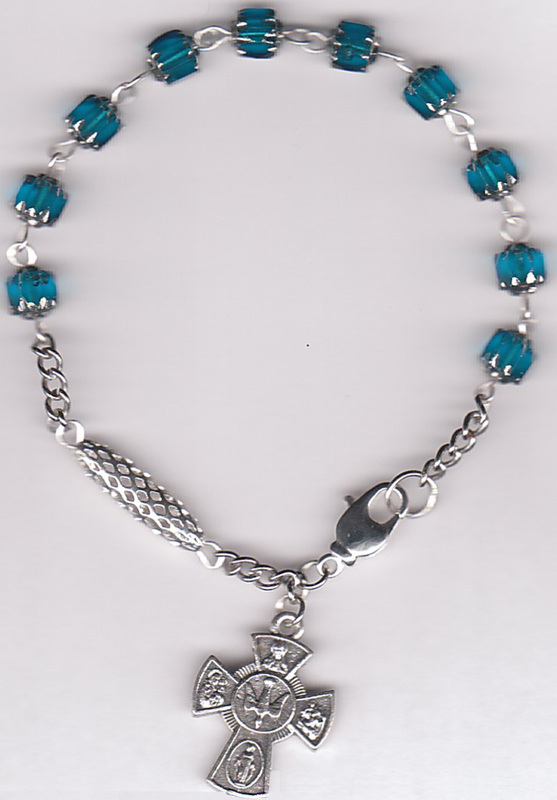 Accented with two sterling silver filled floral charms & sterling filled drops w/aqua tassels. 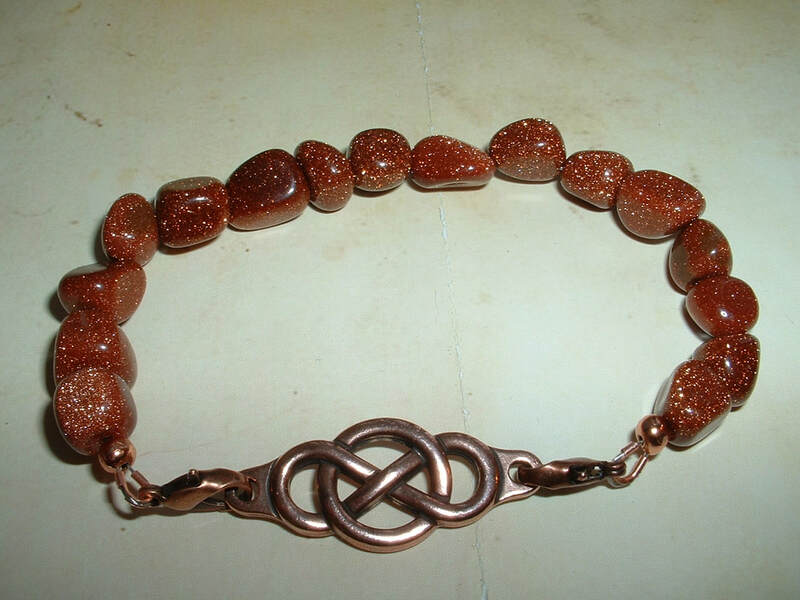 Tumbled & hand strung genuine Venetian Goldstone fitted with Copper filled components, center Copper filled Celtic Infinity design is removable, reversible & changeable with another design to create a whole new look! Close Up to show lobster claw clasp. 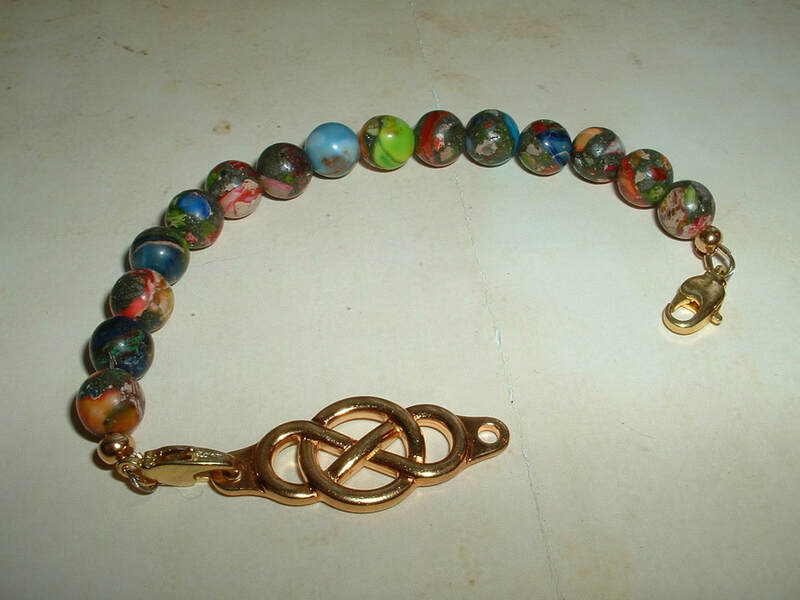 Lightly tumbled & hand strung genuine Dakota Jasper gemstones fitted with 22k Gold filled components, center 22k Gold filled Celtic Infinity design is removable, reversible & changeable with another design to create a whole new look! 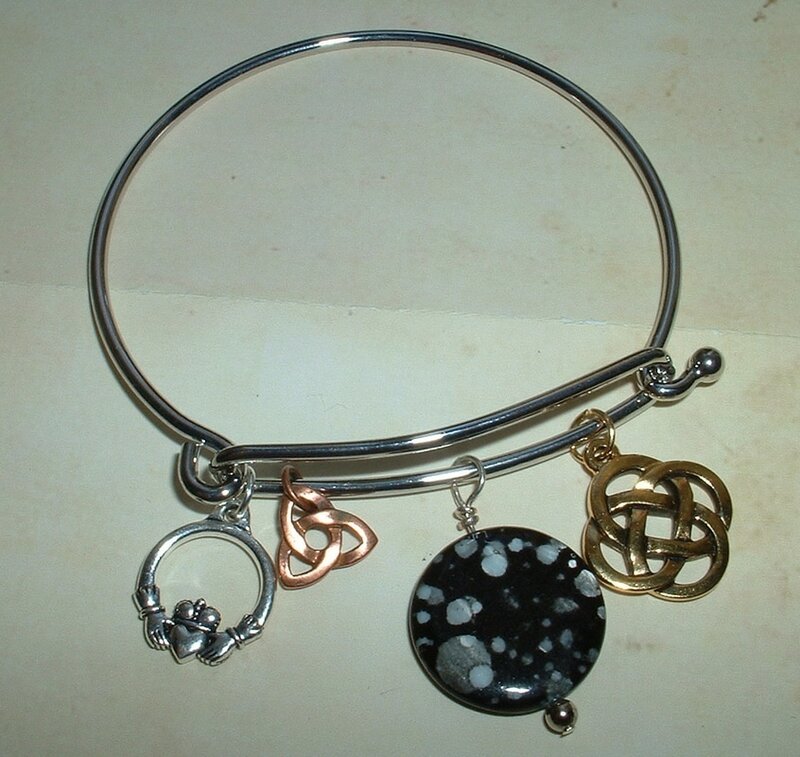 Stainless steel charm bangle bracelet featuring Sterling filled Claddagh, Copper filled Triquetra, 22k Gold filled Elemental Knot & Snowflake Obsidian. 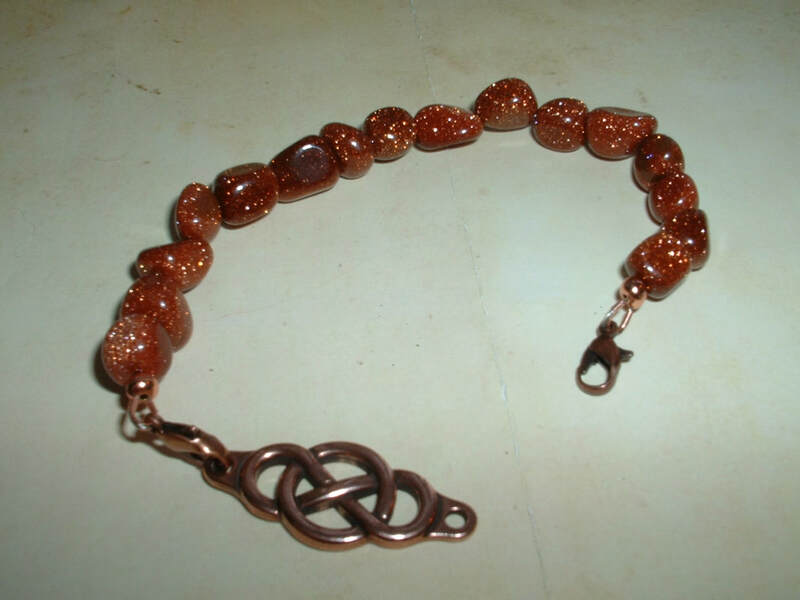 ​Sterling, Gold & Copper wire work though out. Adjustable up to a 7.5" size. 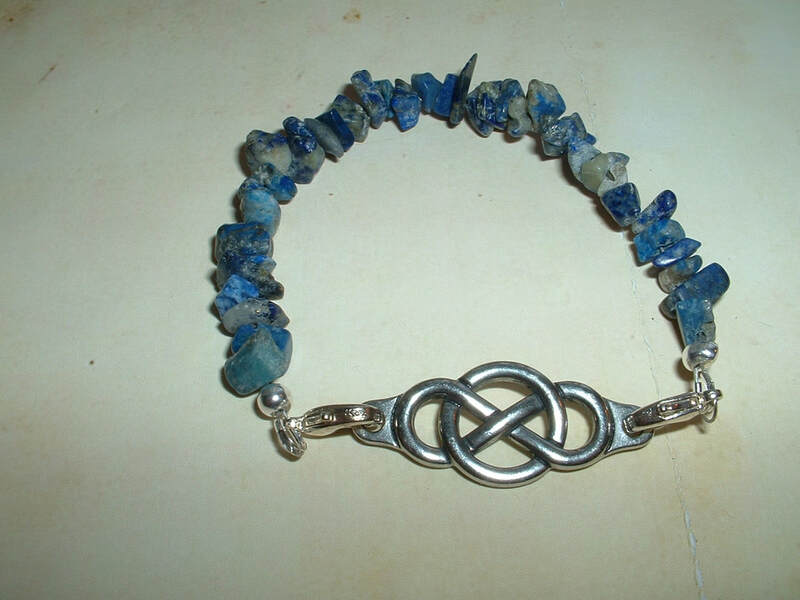 Close Up of Sterling Irish Pride Bracelet. 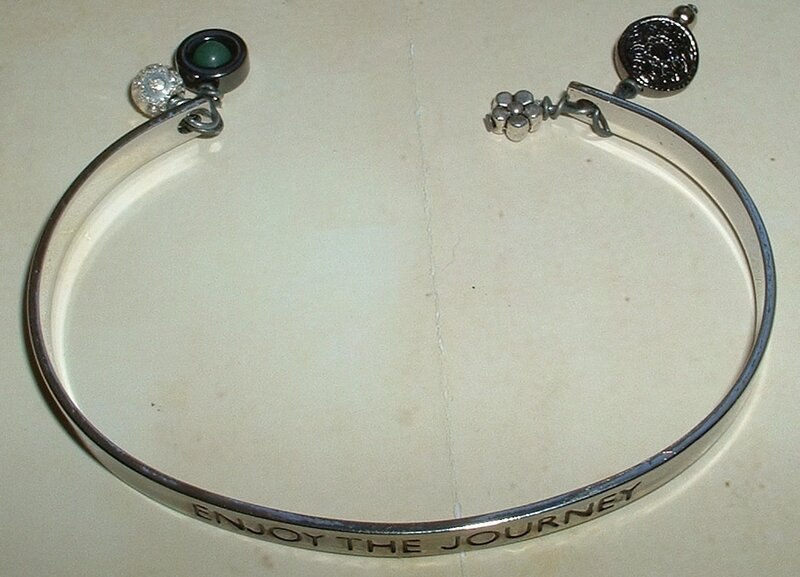 Stainless Steel cuff bracelet featuring Sterling filled laser etched disc & sculpted Sterling bubble, Hematite & Jade beadwork. 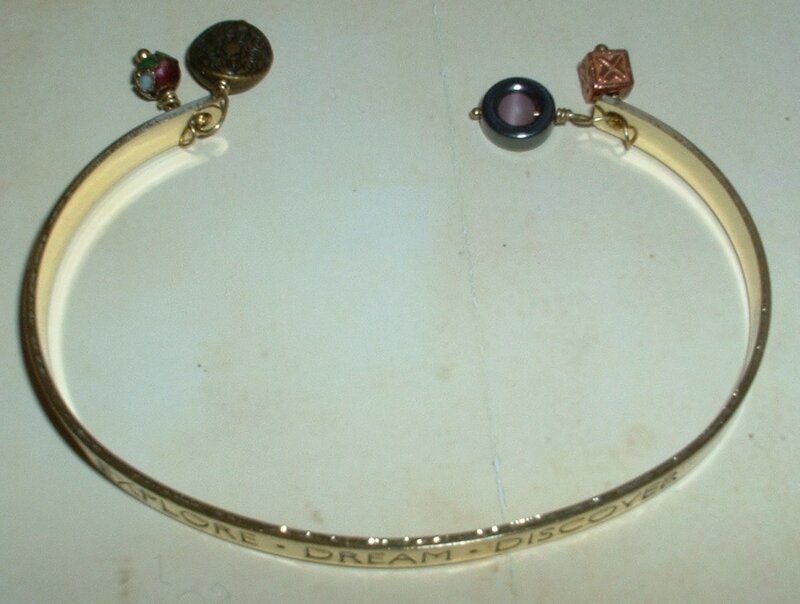 22k Gold Plate Stainless Steel cuff bracelet featuring Gold filled laser etched disc, Copper filled cubes, Cloisanne, Hematite & Rose Quartz beadwork. 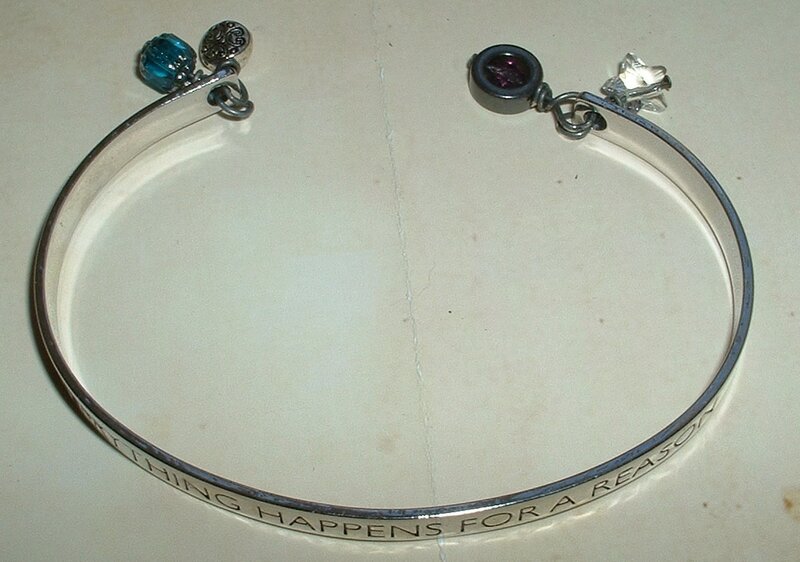 Stainless Steel cuff bracelet featuring Sterling filled laser etched disc & sculpted Swarovski flower, Sterling leaf Swarovski, Hematite & Amethyst beadwork. 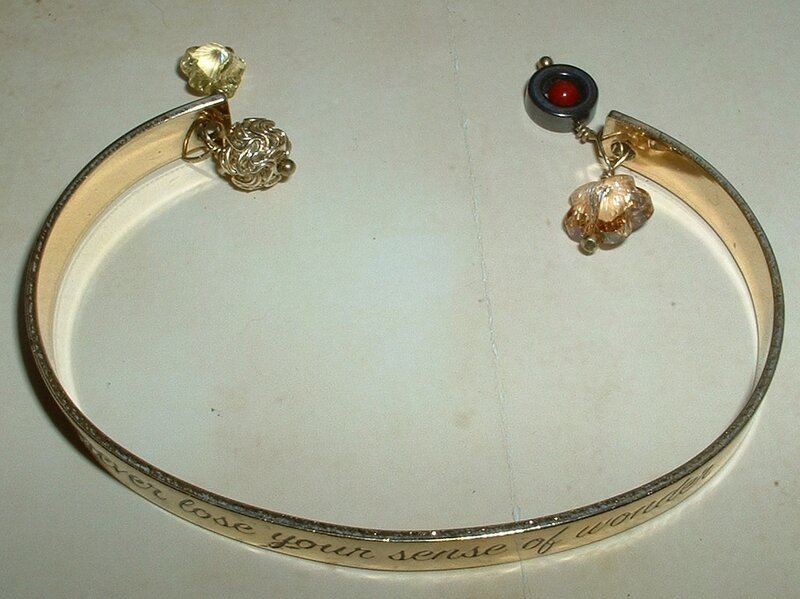 22k Gold Plate Stainless Steel cuff bracelet featuring Gold sculpted ball, sculpted Swarovski flower small & large, Hematite & Red Coral beadwork. with stainless steel chain for extra durability. 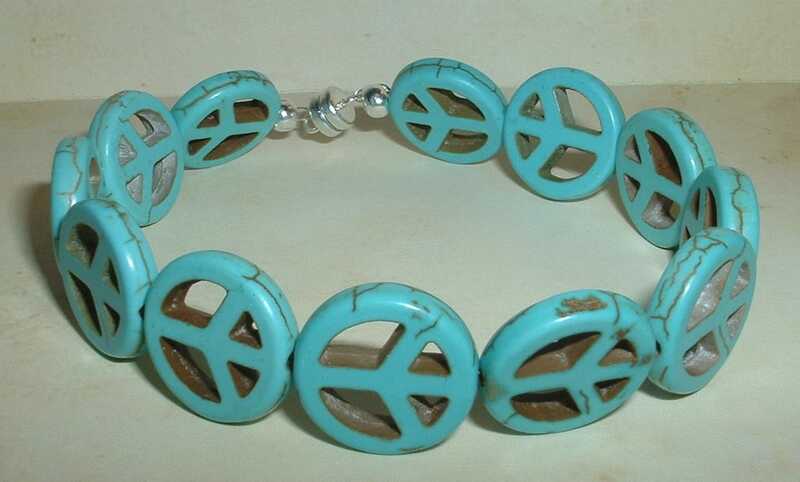 Sterling & Carved Peace Sign Turquoise Bracelet with a strong magnet clasp. 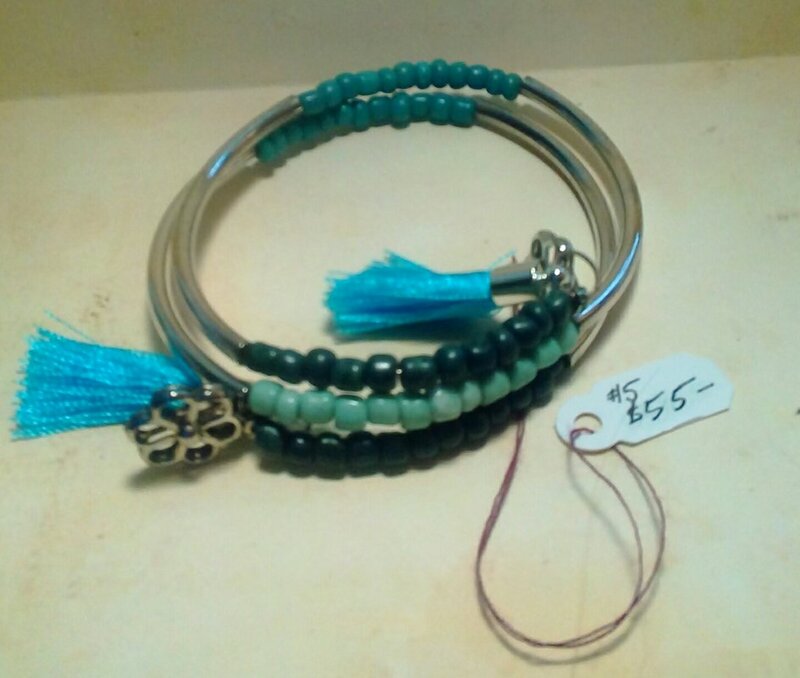 Pairs Beautifully with Peace Be With You Earrings of either color!